I was born in Finland. This means that I could ice-skate and ski before the age of 5. In the not-so-distant past these were skills that were needed for survival in the rural areas of Finland. In my hometown of central Helsinki these were the happiest past-time activities of childhood. Olympic Games are for grand gestures – childhood days spend in winter play are for happy life. This morning many great words have already been said about the special relationship China and Finland share. The bond between our countries is undeniable. This is my third trip to Beijing since I became the Mayor a year and a half ago. It almost feels like coming to my second home. Our collaboration has been fruitful in the fields of technology, travel, tourism, smart solutions, design and culture. Now we are able to move to an area that combines all of these fields – winter sports. Our world is transforming rapidly. The world is smaller, more accessible, more understandable and more fluid than ever before. Still our success in solving the future challenges we share is depended upon our ability to become even closer. Cities are at the core of this change. Cities’ ability to offer practical solutions and real-world test cases for the most pressing challenges is crucial. When nation states are able to reach wide based commitments, cities will act as the executors. Businesses are also an important part of this ecosystem. Only by working together are we able to create lasting impacts. Transformation is the new standard – this mindset is very much shared with China. Beijing and Helsinki are historically and practically sister cities. Some 30 years ago, in 1988, Helsinki and Beijing were connected by the first ever direct commercial flight from Europe to China. Today Finnair has almost 40 weekly flights from Helsinki to seven different cities in China, making us the leading hub of Northern Europe. We are the forerunner in developing services for the Chinese travelers. More and more Chinese want to experience destinations as independent travelers and try local, genuine experiences. In Helsinki this is enabled by the WeChat MyHelsinki visitor app by Helsinki and Chinese internet service giant Tencent . our collaboration is also based on many forms of business and culture. We celebrate Chinese culture and community in Helsinki with a substantial Chinese New Year’s celebration and strengthen our collaboration with new networks and events. This September we are the proud host city of the World Tourism Cities Federation Fragrant Hills Summit. We also currently discuss widening our collaboration in the field of design with the City of Beijing. Even though our scale is very different, our ambitions in many fields are matched. As you know, Finland is also well known for snow. Family life, activities, sports and transportation tend to center around snow during the winter months – the quality of it, the amount of it, the lack of it. Snow and wintery conditions are in the heart of how Finland has developed as a country and how we live our everyday lives. Like China in their preparation for the Winter Olympics, Finland has always understood that winter sport is about much more than competition – it’s a way to activate people and families, create health and well-being. The business sector that surrounds winter sport is also multifaced ecosystem of technology, infrastructure, services, design, events and education. I propose that one of our central missions for the China-Finland Year of Winter Sports should be the lasting impact we can have on people’s lives by offering products, education and services that create a desire for a more active lifestyle that promotes long and happy life for all. For this, we need the whole ecosystem to come together. One of the most important platforms for knowledge sharing is going to be the Winter Sport Week in Helsinki in the second week of April, organized in collaboration with the Ministry of Education and Culture, City of Helsinki and Helsinki Business Hub. Snow-how, smart infrastructure, education and social and environmental responsibility will be among the central themes of the week. We hope for concrete outcomes that will serve – not only the theme year and the Olympics – but our joint winter sport ecosystem also in the future. Today we gather to celebrate our mutual commitment to offering the world’s best experience, technical ability and infrastructure for the winter sports. 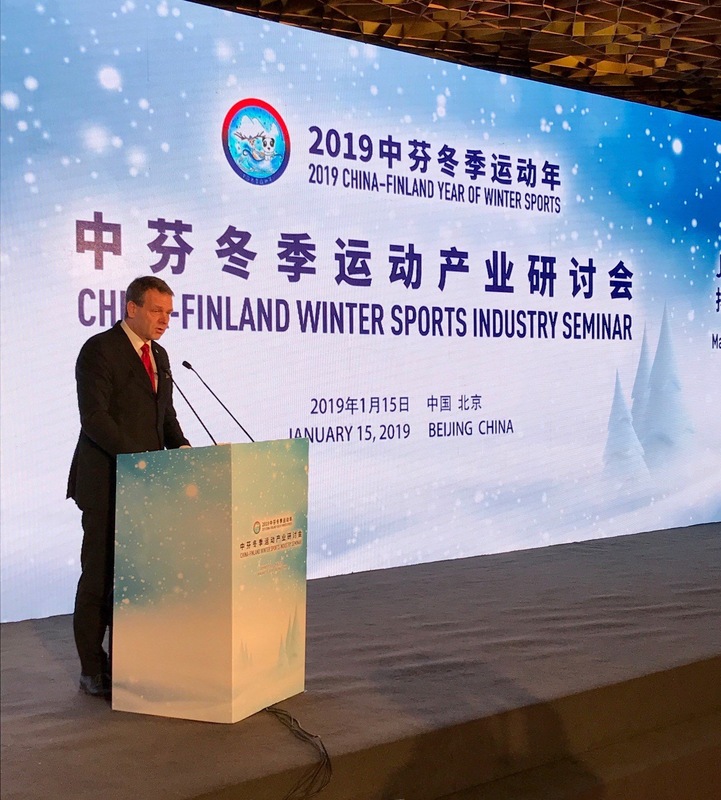 Helsinki is proud to participate in the China-Finland Year of Winter Sports and we feel confident that this will be a beginning for yet another way in which the Chinese and Finnish collaboration will produce historic, world-class results – not only in business – but in the way people live, work and play. Käytämme sivustolla evästeitä parhaan mahdollisen käyttäjäkokemuksen tarjoamiseksi. Sinulla on oikeus olla hyväksymättä evästeiden käyttöä, mutta huomaathan, että se saattaa rajoittaa verkkosivuston toimivuutta.